From China to Borneo and Beyond 海外华人的中国魂: 从中国，到南洋，到更远: abc Letter T, all things related to tea. Two families leave China 100 years ago, This is a journal recording their passage, their so-journ in Borneo and then on to Australia, New Zealand, Singapore, England and beyond. A fascinating account of how time and place have changed the members. abc Letter T, all things related to tea. 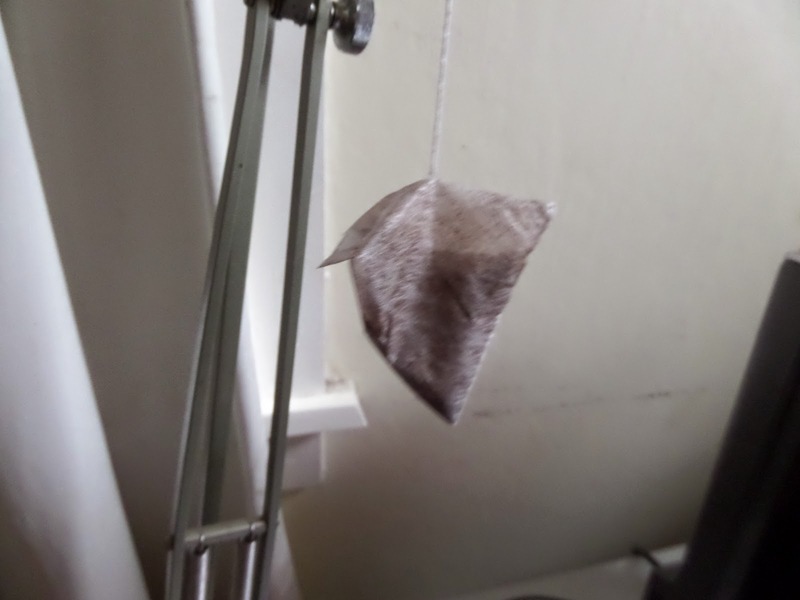 a camera trick of a giant Tea bag hanging from a crane. Heston Marc Blumenthal, OBE (/ˈbluːmənθɔːl/; born 27 May 1966) is an English celebrity chef and owner of several restaurants. He is an advocate for the importance of scientific understanding in cooking. Marc made a giant tea bag like this shape and a giant dunking biscuit. He used a crane to make the tea. When my late paternal Grandma left China for Borneo almost ninety years ago, she brought a Chinese tea pot with a paper mache cosy. She also brought a slave slave, given to her by her parents to serve her in any way she liked. This slave girl aka as MUI ZAI was in an era when the paternalistic Chinese society when males were superior to the useless girl. Grandma returned to China before the World War two when the Japanese occupied a big chunk of Asia and Borneo. My mum and siblings and I never got to meet and know this woman who gave birth to my dad. When I visited my Grandpa, He always had his tea pot filled with black Chinese tea. It was kept warm by the paper mache. Grandpa married a second wife, so these items went to her. That pot was very valuable as an antique. When Grandpa was still alive, an antique dealer came round to houses of old people to scour for old things. He offered a good price for the tea pot, and the paper mache. The latter, the antique dealer had never seen. Grandpa refused to sell, no matter how good the offer was. He told us, it was the only family heirloom that was worth anything. 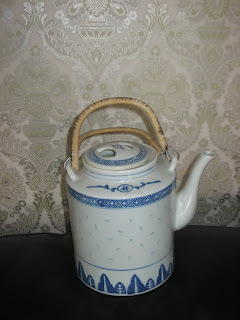 We teased him that he was an old romantic who could not give up the tea pot because it held so much memories for my late grandma. My second grandma is still alive. She is 100. I don't visit her often as for the last thirty something years, I have lived in Canada, New Zealand and Singapore. As for the tea pot, she doesn't use it anymore. No, it is too precious to use, just in case someone breaks it. She will talk about it though. Whilst in Singapore, Tow Guan pottery at Jalan Bahar next to NTU is a gem. I chanced upon this Chinese tea pot. I was so excited, it was an exact replica of Grandma's tea pot. I know it is a replica, there is no need to make a song and dance about it. But it is the nearest I could get that was Grandma's. I bought three. Two for my older sisters and one for myself. I emailled Rose and Elizabeth. Elizabeth has the same sentiments as me. She was delighted to have it. But Rose, she wanted only the real McCoy. I gave that teapot to a very good friend Anne W.
When Anne W left Singapore to live in Christchurch, she brought a little tea pot for me, bought at Tow Guan. You would have to pay a lot of money in New Zealand. She visited Auckland and stayed with me. I took her to my favourite places. This tea cup is not for drinking. My girls got this as a souvenir for Mum and Dad. 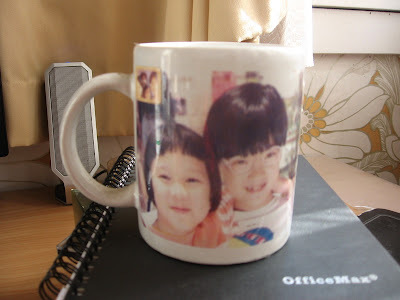 Both girls have live abroad, and this cup is very precious. I HAD tea today. Snowy, and after shoveling, the right choice. Ah Kung, Grandpa's 71st birthday. Roger Cheng and his men. Coincidence, friends who knew Uncle Kok Fei. Chinese writers writing in English. China's president Mr Xi visits New Zealand. How to serve a fruit cake. Celebration and honouring job well done. Poppy flowers and war heros.